Hi, I am interested in your 1968 Chevrolet Corvette (stock #MHM3158) listed on Autotrader for $24,900. I'd like to get more information about this vehicle and confirm its availability. 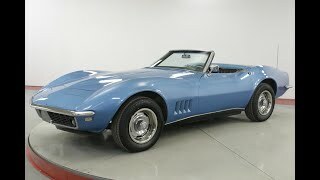 Worldwide Vintage Autos is pleased to present this 1968 Chevrolet Corvette. The Chevrolet Corvette, known also as the Vette or Chevy Corvette, is a front engine, rear drive, two-door, two-passenger sports car manufactured and marketed by Chevrolet across more than sixty years of production and seven design generations. As Chevrolets halo vehicle, the Corvette is widely noted for its performance and distinctive plastic either fiberglass or composite bodywork.